Kalimat is a non-profit, independent, media production organisation that features bold, engaging political, design, film, fashion, literature, musical and new media content. 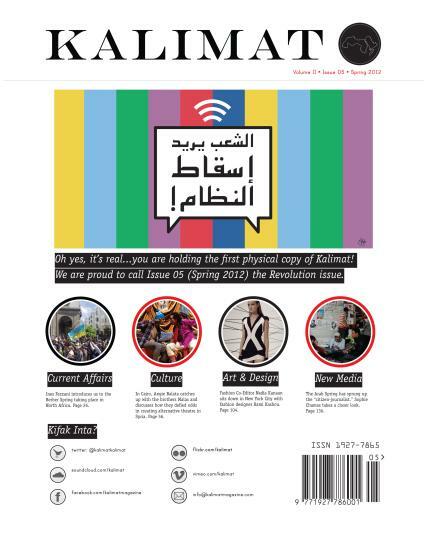 Buy a single copy or subscription to Kalimat magazine. Launched in 2010, the magazine is a social, cultural and political quarterly committed to providing an outlet for open expression within the Arab region and its Diaspora. At the same time, it is a visual communication tool that serves to educate both those who read it and work to create it. The purpose is to be an open outlet for expression and to increase participation within the cultural/creative scene, providing a platform for Arab creatives to engage in thought and action around ideas, people and business, moving the world forward. Through the value of design-focused thinking, data visualisation, education and conversations with influential Arab creatives, Kalimat transcends and redefines mainstream media, challenging the status quo. The content is created by Arab people, the writers are Arab, the editors are Arab, the people featured are Arab, but the content is for everyone to read.